There are four sizes in which you can display video tracks: Mini, Small, Medium and Large. The size of a video track affects how much vertical space the video track takes in the Timeline view. You can adjust the display size of each track individually. By default, all video tracks are displayed in small size. 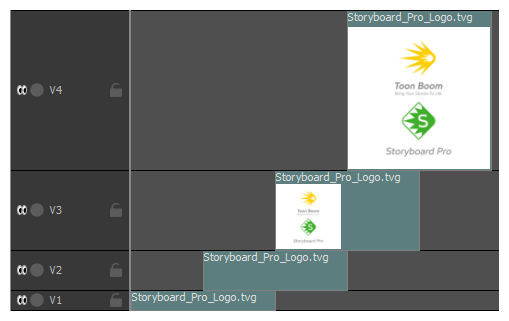 Making video tracks smaller can be useful if you have many video tracks and want to see more video tracks in the Timeline view at the same time, without having to scroll up or down or to increase the amount of space the Timeline view takes in your workspace. Making video tracks Medium or Large allows you to see a thumbnail inside each video clip, making it easier to identify the clips visually as you work with them. In the Timeline view, right-click anywhere on the video track, then select Track Size > Mini, Small, Medium or Large. The height of the video track in the Timeline view is adjusted to the new setting.